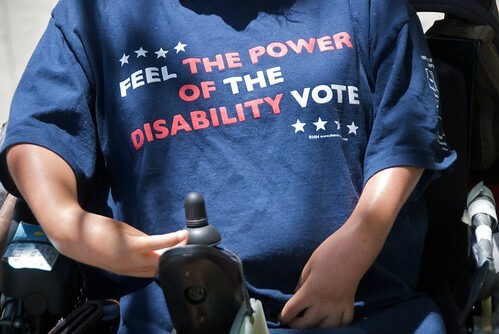 Image: “Feel the power of the disability vote – Protest of California health care budget cuts (2009)” by Steve Rhodes, used under a creative commons license. Don’t forget to submit to this month’s Disability Blog Carnival! Restaurants, airlines, and other companies tend to struggle when it comes to dealing with a person with a disability. But one line of work we haven’t touched on yet is the media. And believe me, despite working in the journalism field, the media is not exempt from my disdain! There are three phrases found in almost every article about a person with a disability. And each of these statements drives me up the wall. Let’s examine them individually. For Smith, the fact that Allen was HIV-positive was like he was walking around with ticking time bombs inside of him, waiting to tear down people in his wake. By all accounts, it was a gross misuse and misapplication of the Michigan anti-terrorism law (even the authors of that law eventually criticized Smith for labeling HIV-positive people as terrorists), but for months Smith wouldn’t cave in to demands to drop the charges. He wanted Allen to be charged with bioterrorism, solely for living with HIV. We chatted about technology for a while and this eventually turned into useful apps for my iPhone in terms of my deafness and other things I’d like to make life easier in my Hard-of-Hearing World. When we were talking though, my mind went quite blank, but now I’ve had a chance to think a little bit more about it, it’s made me resolve to start compiling my Deafness Wishlist – things I want changed or services I’d like to see. But other research projects that Robison has been blogging about strike me as problematic. Take, for instance, this post lauding some new Autism-Speaks grants. Basically, it seems to me more of the same: research pushing for earlier identification, insistence on the centrality of “early intervention,” etc. What does this do for autistic people right now? I note that autistic children are already being identified at earlier and earlier ages. Why is it so vital that we keep pushing the age down? Does it really matter that much if we identify an autistic child at 22 months as opposed to 28 or 29 [months] for instance? I’m not convinced, and the endless repetition of the “early intervention” mantra is not a substitute for actual science which is willing to question supposed “truths.” Nor does this kind of research truly deserve, IMHO, the amount of money it is receiving. Where are the supports for older autistic people, as researchers rush to “identify” earlier and earlier? The Province of Nova Scotia spends about 3.5% of its annually recurring health care budget on mental health, and a fraction of that on child and youth mental health services. This is in spite of the knowledge that about 3/4th of all mental disorders arise prior to the age of 25 years and increasing realization that early intervention and effective treatment may prevent substantial long and short term negative outcomes and yes, maybe in this case would have prevented such a tragic outcome. “HIV-positive women are holding the healthcare system accountable for the wrongs done to them,” said Veronica Kalambi of the Women’s Health Network. Kalambi said these alleged violations of women’s rights are in the context of a broader set of violations occurring against women at hospitals and clinics. “People should have peace of mind that if they are HIV-positive, they can still go to the hospital and be treated with dignity and equality,” said Vicky Noa, who claims that she was sterilised in 2001. She organised the Ondangwa sit-in. Tucked in the city’s deep south near 42nd Street and 12th Avenue, it is one of 16 city public schools testing an innovative new program that mixes kids who have special needs into regular classrooms. The two-year pilot project is part of an attempt to move away from “coding” students according to disability, then allotting funds based on the number of children with special needs. Canada: No Taser on mentally ill: Lawyer This case is about the death of Howard Hyde in police custody in Halifax, NS. Here is an archive of news stories about the tasering case. UK: Wheelchair ramble along Y Lôn Goed Gwynedd Council is supporting a joint project which arranges an annual programme of guided countryside walks for the less abled and wheelchair users – again this year the walks will visit some of Wales’ most fantastic locations.